James, Rajah of Sarawak,KCB (born James Brooke; 29 April 1803 – 11 June 1868) was a British adventurer whose exploits in areas of the British Empire led to him becoming the first White Rajah of Sarawak. In 1833, He inherited £30,000, which he used as capital to purchase a 142-ton schooner, The Royalist. Setting sail for Borneo in 1838, he arrived in Kuching in August to find the settlement facing an Iban and Bidayuh uprising against the Sultan of Brunei. Greatly impressed with the Malay Archipelago, in Sarawak he met Pangeran Muda Hashim, to whom he gave assistance in crushing the rebellion, thereby winning the allegiance of the Sultan, who in 1841 offered Brooke the governorship of Sarawak in return for his help. 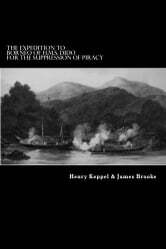 Raja Brooke was highly successful in suppressing the widespread piracy of the region. He was granted the title of Rajah of Sarawak on 24 September 1841, partly attributed to his relationship with a daughter of the Sultan, although the official declaration was not made until 18 August 1842. Admiral of the Fleet Sir Henry Keppel, GCB, OM (14 June 1809 – 17 January 1904) was a British admiral, son of the 4th Earl of Albemarle and of his wife Elizabeth, daughter of Lord de Clifford. He entered the navy from the old naval academy of Portsmouth in 1822. He became lieutenant in 1829 and commander in 1833. His first command was largely passed on the coast of Spain, which was then in the midst of the convulsions of the Carlist War. In 1837 he was promoted post captain,and appointed in 1841 to the service in China and against the Malay pirates, a service which he repeated in 1847, when in command of HMS Maeander.